I review some pretty expensive high end items, but nothing like what icruise is reviewing tonight - he's looking at the life size C-3PO from Sideshow. Tell us all about it! So does the piece live up to my expectations? The short answer is yes -- for the most part. For the long answer, you’ll need to read the rest of this review. Before I go any further, though, let me just say that this is a difficult piece to photograph, since it reflects light. I think the shots I took with no flash give the most accurate overall impression, but it’s difficult to get a shot that really shows the actual color. I also only took one shot with the eyes turned on, since it makes photography more difficult. 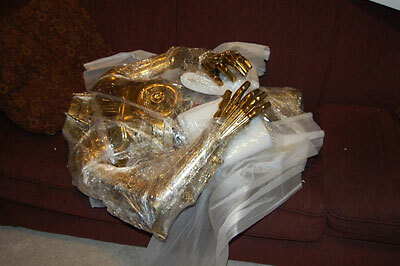 C-3PO comes in four large boxes, which are sent via a freight service and arrive strapped to a wooden pallet and covered in plastic wrap. (Shipping within the US is free.) The outer shipping boxes each have a hand-written number in one corner. While Sideshow is not numbering the pieces themselves, it does seem that this hand-written number corresponds to the item’s edition number out of 250. I got number 5. 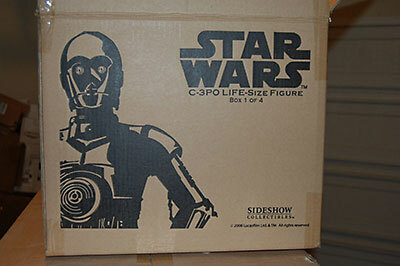 Each inner box features a black and white picture of C-3PO. Obviously this is not something that you will be picking up at a local store, so the packaging really only has to serve one purpose -- to protect the statue on its journey to you. In that sense, the packaging seems to work well. My boxes did have some minor exterior damage, but nothing that would affect what was inside. If you should ever need to move you will probably want the original shipping boxes, so saving the boxes is probably a good idea. But they do take up a huge amount of space. One other aspect of the packaging is the plastic wrap. Each part is wrapped in clear plastic wrap and small pieces of foam were also placed under parts that could possibly break off or otherwise be damaged during shipment. The plastic wrap was actually somewhat difficult to take off, since it was quite strong and could not be easily unwrapped. I ended up cutting through it in parts with a Swiss army knife, but of course you will want to be very careful when doing this. Once you get the parts unwrapped, you’ll need to assemble them. 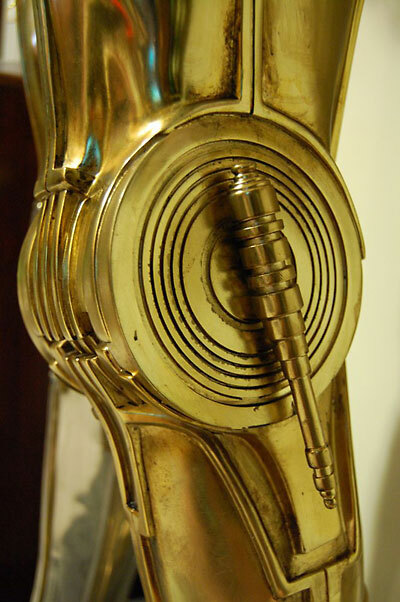 C-3PO is broken up into four main pieces: the head, torso (with arms), and two legs. In addition, he comes with a back plate and restraining bolt that attach by magnets. There is also a separate polystone base which is made to resemble a section of the Millennium Falcon’s floor. The easiest way to understand how he fits together is to view the short assembly video posted on the Sideshow product page. Sideshow also includes a copy of this video on DVD with the droid, which is a nice touch. It’s difficult to describe the assembly process, so you might want to watch it to help understand the rest of this section. Sideshow describes the droids as being composed of “polystone skinned fiberglass castings, metal components, and other materials.” I’m not entirely sure what that means, but I can say that he’s not made of metal for the most part, even though he looks like he is. Whatever the materials used, he’s quite large and heavy, which makes assembling him a little tricky. I’m sure he weighs at least 200 pounds without the base, and he stands around 5’9” tall at the tip of his head. On the base, he’s around 6’1”. Having someone else help you is definitely a good idea, since he is just so unwieldy. He seems relatively stable once you have him together, but it should be mentioned that he is not attached to the base very well, and this could be a problem for people in earthquake-prone areas. His right leg has a short metal rod that fits into a hole in the base, and that’s the main thing that keeps him up. His other leg just sits on the base (the bottoms of the feet are covered in a black velvet-like material so as to not scratch the base). His left leg attaches to his torso with a long metal rod and a hex nut, but the torso only sits in a sort of receptacle in the right leg and isn’t attached to it in any way. Only gravity keeps it together. I think this will work OK, but I can’t help but wish that they had made it so that each piece was securely attached to the body. As it is, there’s no way you could move him without disassembling him. I should also mention that the hex nut required for attaching the leg to the torso was not included in my boxes. Sideshow did send one out to me, but I decided to just take the rod to the local hardware store to get a replacement nut. It cost less than $1, and it allowed me to finish up the assembly that day instead of 5 days later when the replacement from Sideshow finally arrived. 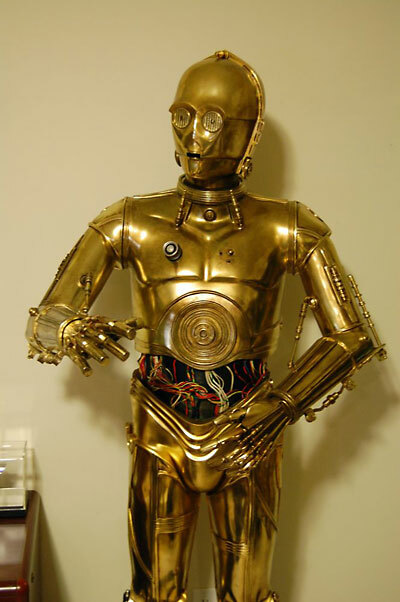 The biggest characteristic of C-3PO is of course that he is gold plated. Not just gold colored, but actually reflective. 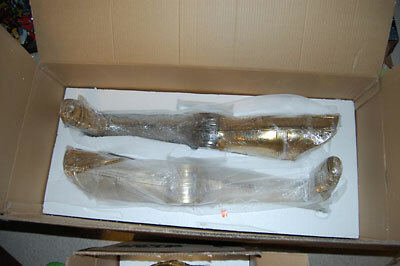 Sideshow chose to replicate C-3PO’s weathered and dirty Tatooine look, rather than the clean and shiny “throne room” finish. So his paint job consists of two things -- a shiny chromed layer and a layer of weathering on top of it. 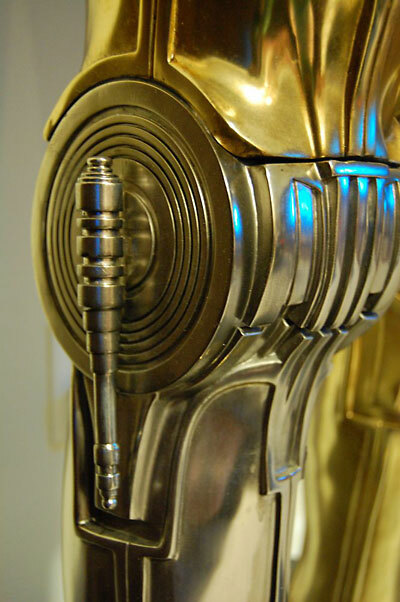 Not having seen an actual weathered C-3PO suit in person, it’s difficult to say how accurate the paint job is, but I think it looks very good overall. 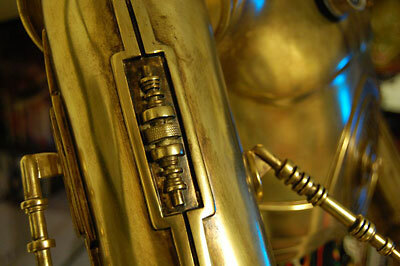 It has an actual chrome-like finish, rather than something like gold-colored paint. You can hold your hand up to the surface of the statue in most places and see it reflected, at least partially. The gold seems a bit dark in color, but part of that is due to the weathering, and of course it is reflective and will take on some of the coloring of the things surrounding it. I noticed that he appeared darker when I moved him closer to some of my dark cherry bookshelves. From what I can tell, the weathering process involved actively dulling the shine in places, in addition to applying brownish paint to simulate dirt and bring out some of the details. I can’t tell if they actually took an abrasive material like sandpaper to the surface or just applied a coat of something over the top of it, but there are places where the “metal” has more of a matte finish. He even has trails of grime going down his chest and on the back of his head. If you look closely in places, you can see brush strokes or other areas where the weathering appears a bit artificial, but from a reasonable distance the effect is quite good. 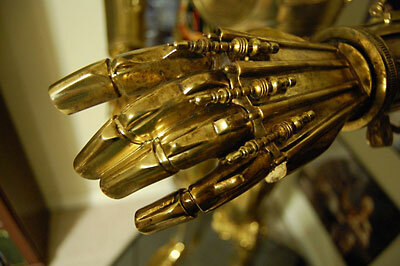 I do think that they may have gone a little overboard on the weathering in places, like the hands. I also think that the choice to go with the weathered finish was a pragmatic one, as well as an artistic one. I’m sure that using this finish helped them avoid a lot of potential production problems. When you have a weathered finish, you can get away with small scratches and blemishes that would stick out like a sore thumb on a shiny chrome surface. Indeed, there are a lot of small scratches and imperfections that you can find if you want to look very closely at the surface, and I don’t think they were all intentional. I even spotted a few drops of glue that got spattered on the figure. But with this finish it works -- for the most part. My C-3PO has a blemish that’s around an inch long on his right cheek. I don’t know if it’s a scratch or a fault in the plating, but from the right angle it looks very obvious. From other angles it is practically invisible, but I don’t think that a large blemish on an obvious area like the face is acceptable. 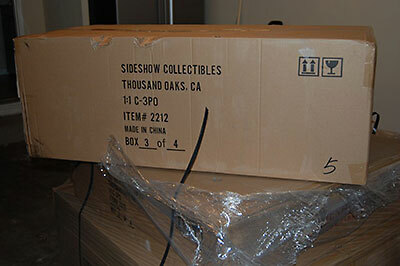 Luckily, Sideshow’s customer service has been very helpful and they are sending me a replacement head free of charge. That’s right, articulation. I wouldn’t necessarily expect a statue like this to have any articulation at all, so this is a nice bonus. His head can rotate, his arms can move up and down at the shoulder, and his hands can turn at the wrists. Obviously it doesn’t compare to even the most basic action figure, but it’s exceptional for a high-end statue like this, and I really think it adds a lot to the piece. I gave him the full score for this category because given C-3PO’s nature it’s difficult to think of anything else that they could have done with regard to articulation. You can get quite a number of different looks just from moving the head or arms a bit. I am mostly sticking with a simple pose that has his head looking slightly off in one direction and one of his arms up in an “excuse me, sir” pose. But it’s even possible to turn his hand around and make him hold an object, or to have both of his arms up like he’s hailing a sandcrawler. The arms do make a bit of a squeaking sound when you move them, and the hands are not easy to turn, but there doesn’t seem to be any danger of them falling out of a pose, so I’m happy with that. 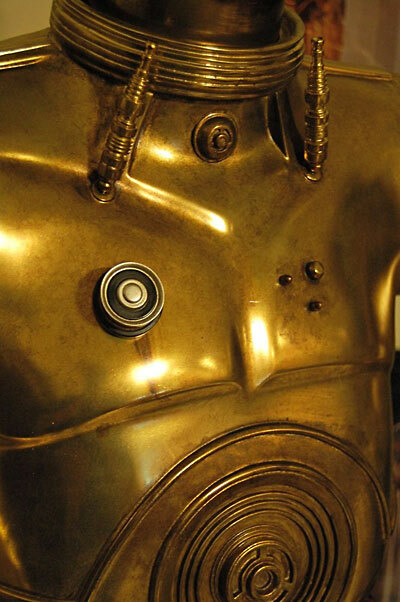 There is a button in the back of C-3PO’s head that activates his lights and sounds. You press it once to turn on his eyes, again to turn on his voice, and one more time to turn everything off. The lights are nice and bright, and they flicker in time with the words that he is saying if you have the voice activated. 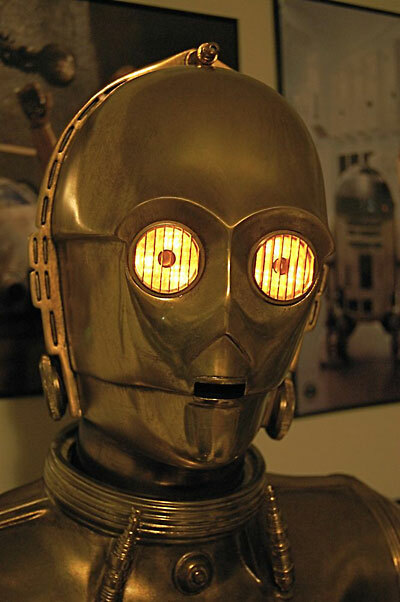 The voice consists of lines taken directly from A New Hope, and comes out of a speaker hidden in his mouth. This is nice since it gives you the impression that he’s actually talking. The bad part about the voice is that there are only a relatively small number of lines (I haven’t counted, but I would guess no more than 20) and they are always played in the same order. Playing them all takes less than 3 half minutes and then they start back at the beginning. Needless to say, you’re not going to leave the voice on for very long. It’s a nice feature and does give the piece more character, but it’s really best used to show off the statue to a visitor, and not something that you’re likely to use very often yourself. I can’t help but wish that they had used a motion-activated voice that played random quotes, and that they had used a much larger selection of quotes. At the price of this piece, they could have even gone the extra mile and included an MP3 player function. This would allow you to add your own lines or even have him play music from the film. For that matter, I would think it would have been possible to include a remote control for the lights and sounds, rather than requiring you to reach behind his head. In short, my feeling is that the voice function is a nice addition, but also a bit of a missed opportunity. 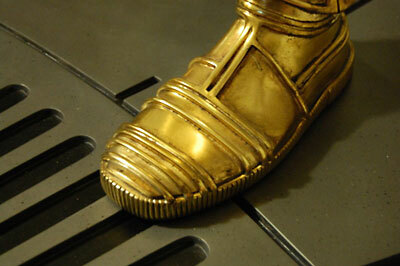 I should also mention that the AC adapter plugs into C-3PO’s left leg at the heel. This means that you have a cord trailing from the statue, which may not look great, depending on how you have him displayed. Ideally, they would have put the AC adapter plug in the base, as they do on the PF figures with light-up lightsabers. One more thing. His head plugs into his torso with a plug similar to those on old-fashioned stereo headphones. Once when I was removing the head from the body, this plug actually pulled out of the head and stayed stuck in the neck, attached by some dangling wires. I put the wires back in the head and the electronics still work, but needless to say this was a disturbing experience and if I wasn’t already getting a replacement head I would have asked for one after this. I know of a number of people who have had issues such as R2 units arriving with non-working electronics. 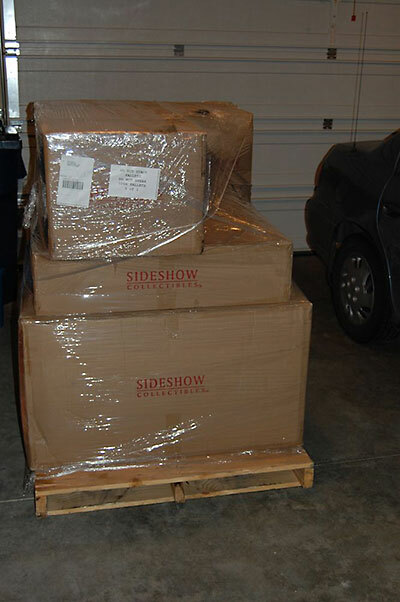 While Sideshow’s customer service is very good, it’s frustrating to see so many problems with quality control. The biggest and most obvious problem is the eyes. People on a Star Wars forum that I frequent have been discussing this issue for months -- ever since the first prototype pictures surfaced. 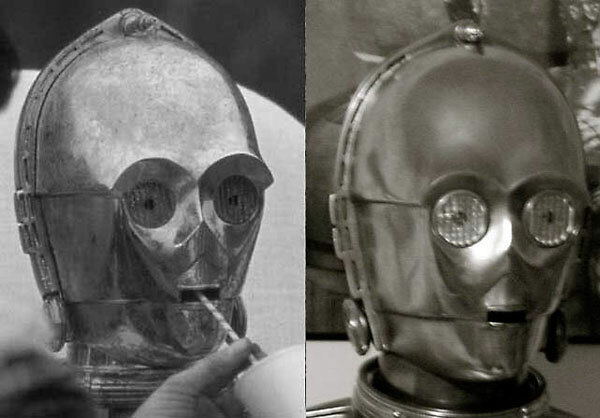 It seemed that the Sideshow C-3PO had eyes that were clearly too big. After getting him in hand, I see that the problem is actually that the eyes have a metal border around them that does not exist on the actual prop. It’s a millimeter or two thick and gives the eyes the appearance of being too big. I should say, however, that when you see him in person, this is not really a very big deal. 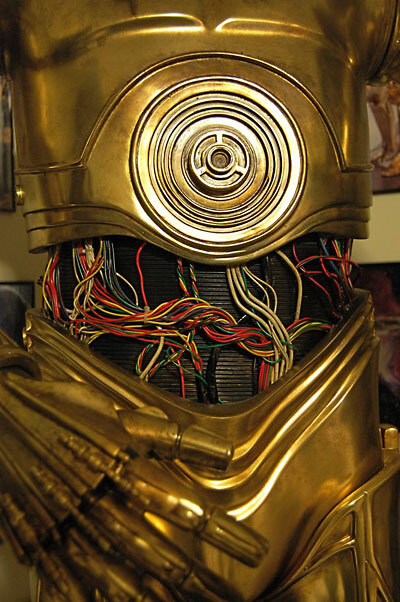 It looks good, and still definitely resembles C-3PO as a character. Slightly different than the actual prop, but good nonetheless. One other accuracy issue is the number of indentations on the “halo” around his head. 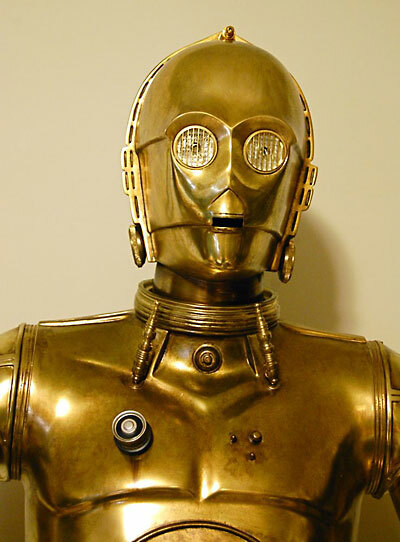 On the actual C-3PO head, there are 6 indentations above his “ears,” but on the Sideshow version there are only 5, leaving an area of blank space around the “horn” at the top of his head. I personally didn’t notice this until it was pointed out to me several days after getting the statue in hand, so I can’t say that it ruined the look for me by any means. 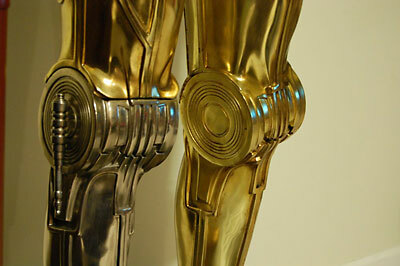 But it is a very puzzling change, since just about every C-3PO toy and statue that I own has this detail correct. I wonder if it wasn’t done on purpose, although for what reason I’m not sure. I’m not the kind of person who insists on total accuracy, but this seems like such a simple thing to get right. As far as I can tell, the body looks good. There may be some areas that a prop enthusiast could find fault with, but there’s nothing that stands out to me like the issues with the head. The only issue I have with it is that some of the fingers on the hands are fused together, rather than being totally separate. This makes him look more like a statue than a “real” droid, although it’s only noticeable upon fairly close inspection. The issues with the head are frankly disappointing, since they don’t seem like difficult things to solve. The eyes in particular are one of the most noticeable parts of any statue, and to get them wrong threatens to affect the entire look of the piece. 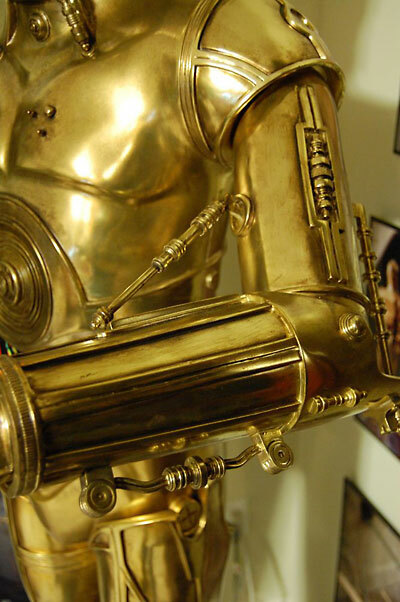 I’ve heard people say that they won’t be buying the Sideshow C-3PO for this reason alone. I think that the statue is good enough in most other ways to make up for this, but it is still a bit disappointing. I don’t think that the casual fan would necessarily even notice these issues, but of course casual fans are not likely to be buying something like this. While this is just a statue and not something that you can really “play” with, it’s hard to understate how impressive it is to have a life-sized droid in your house. If my 3-year-old son is any indication, kids will love him. “CPO,” as he calls him, seems almost like a member of our family at times. This is a very difficult category to score, because the piece’s perceived value depends greatly on how you look at it. I will give you my thoughts on the subject and you can make up your own mind. Obviously at $5,950 this is a hugely expensive piece. If you look at it in comparison with the other items in Sideshow’s Star Wars lines, it may seem overpriced. For the same amount of money, you could get around 20 PFs or around 10 life-sized busts. You do have to wonder if the addition of a full body really warrants charging ten times the price of a life-sized bust. Designing, manufacturing, and selling something like this is a major undertaking, and it seems unlikely that another company will try again anytime soon, simply because the potential market isn’t very big. There’s still a lot of life left in Star Wars as a franchise, but I can’t help but wonder if this will be the last time that licensed life-sized droids will be made commercially available. I guess my conclusion is that the price is very high, but not unreasonable given the nature of this piece. Check that the hex nut and rod were included in your package. Be very careful when unpacking him and make sure that you follow the instructional video carefully when assembling him. Check that there are no blemishes in obvious places. Also make sure that you have a good place to display him. His base is quite large at 30” by 30” and he can’t stand without it. You’ll also need a power outlet nearby for his lights and sounds. Given my experience with the plug in the head, I wouldn’t remove the head unless absolutely necessary. The accuracy issues and high price keep me from giving this a higher score, but I’m quite happy with it overall. It’s hard to imagine a Star Wars collectible that can top it. While it may not satisfy hard-core prop enthusiasts who live and die by accuracy to the screen-used props, most Star Wars fans will probably be thrilled. 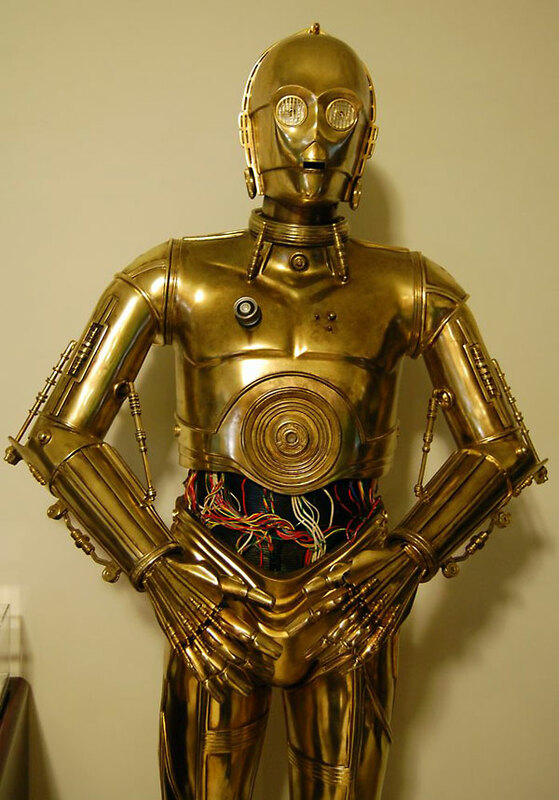 The C-3PO Life-Size Figure is on 'backorder' at Sideshow, which may indicate you can still manage to snag one there, if the price tag hasn't sent you into an epileptic seizure. Figure from the collection of icruise.